← Which Should Come First—Kindle or Paperback? Commuter Fiction—Making a Case for Short Kindle e-books? When I want to shop for something to read on my Kindle, I visit Amazon’s homepage on my PC and click on the Kindle books link. It’s called ‘Kindle books,’ so intuitively what you might expect to see are ‘books,’ right? After a half hour of searching, I may finally find one that suits my mood. Then I examine the product page closely to learn that it’s 36 pages long. Wait a minute. Is that a book? Sometimes, I check out the Look Inside of a prospective book. I see the cover, title, copyright notice… where’s the rest? Wow! How short must a book be not to show anything from the first chapter? A Kindle e-book can have just 12 pages. It can have 6 pages. Is there a lower limit? At 6 pages, I hope there isn’t a title page, copyright page, about the author section, and free sample of another book taking up space inside… I also hope the ‘book’ is self-contained. It would be awfully frustrating to learn that it was really one chapter in a series, where you don’t get any sense of closure until the series is complete. Of course, despite the fact that all of these ‘books’ are listed under ‘Kindle books,’ they aren’t all books. These Kindle e-books include short stories, booklets, presentations, and novellas, too. I understood reasons for the short e-books, but I was still troubled by it. Customers can easily return e-books if they are dissatisfied. (Many do.) They can also check the page count before purchasing, and read the description carefully. If the Look Inside is brief, that’s a big hint. If they’re getting fooled by short books, they can get their money back or leave a review about it. The customer is certainly protected. Writers are posting short e-books for a variety of reasons. Some don’t want to commit too much into their self-publishing endeavors, so a short piece is a way to experiment. Some are hoping to see what sort of customer feedback may come for short writing samples before laying their hearts on the line for full-length novels. Some plan to compile short works into an omnibus later on, such that the omnibus will look like a good value. There are other reasons, too. Not all of the reasons may be justified. It’s not easy to get discovered as a new writer, whether writing full-length novels or short stories. Even 99 cents is a lot of money to invest in for one short story from a relatively unknown author; the story will be over quickly, so just imagine what you’ll spend for several hours of reading buying individual short stories. On the other hand, a full-length novel is a long commitment to make for a reader with a new author. Is it easier to get readers to try out your short story, enjoy your book, and give your full-length novel a shot? Or is it easier to get new readers to appreciate the value of your full-length novel and commit to that as the first thing they read by you? Neither is ‘easy’ for most authors. I recently discovered this phrase in the KDP community forum. I like the concept. It’s changing my view of short e-books. The idea behind commuter fiction is to write a short work that travelers can enjoy at a single sitting on an airplane or bus, for example. If you have a three-hour flight, for example, wouldn’t it be perfect to buy an e-book that you could read in three hours? Authors and publishers have discovered that there is a market for short fiction, and they’ve responded with a way to make short fiction marketable. 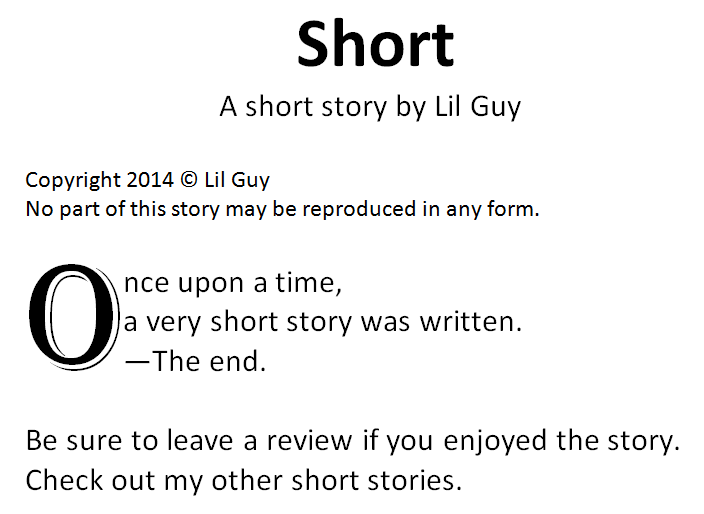 You can call your short story a short story. You can call your novella a novella. You can list the word count. Kindle will estimate the page count. But that might not be the way to market your short e-book. Consider selling it as commuter fiction. Maybe it would be handy to know approximately how many hours it would take the average reader to finish your e-book. A commuter might be interested in that figure. Truck drivers have been listening to audio books for years. They buy books by the hour. If a truck driver is going on an eight-hour drive, it would be ideal to have an audio book that lasts eight hours (or four audio books that last two hours each), for example. The same concept applies to passengers of buses, airplanes, and trains who are reading e-books on Kindles, tablets, laptops, and cell phones. What they would really like to know is how long it will take to read the e-book. Of course, this varies from person to person because we all read at different rates. If they can deduce an average, though, that will help them judge this. I’m not saying that you should write short e-books. It might be harder to sell than full-length books. (Who knows?) Personally, as a customer, I like to receive a good value for my money. However, there are many customers who behave differently than I do. What I am saying is this: If you’re going to write a short book, maybe you can improve its marketability by selling it as commuter fiction. I didn’t know about e-books. I’ve only ever considered a normal sized novel. Im thinking I will still strive for full size, even with the new information. Wealth of info in this post, Chris. Enlightening. I’m so green! 😀 Yes, why didn’t I think of that? I set that up nicely for you. I was just reading in “Passive Voice” that there is room for short-form fiction in E-Books – and here it is again. A lot has to do with marketing and how the short fiction is presented – if it’s presented in such a way that the reader doesn’t feel hoodwinked, I think it can work. I would be a good market – not just because I would read it on the bus/plane, but because I have a hard time facing a longer novel on an e-reader. I can’t “see” how much I have left, and smaller bites of a work make it easier for me to get going with a new book on an e-reader. That’s a great term and I never thought of it that way. There really is a great niche for short reads when you put it that way. I know I’ve grabbed a few when I wanted to spend a day with a book before going back to a project. Call me old fashioned, but I want a “book”…something I can sink my teeth into for the long haul. Not saying there isn’t a place or a market for commuter fiction. My husband takes three hour+ flights quite frequently and he loves to read on board. For short fiction though, I would prefer a subscription to a magazine that offered other news. 99 cents seems a cheat to me when authors pour over 400 page works for years and get 99 cents to $5.00…or worse, give it away free. If I had never been willing to risk on a one book author, I would have never read “To Kill a Mockingbird”, “Catcher in the Rye”, “Wuthering Heights”, “The Picture of Dorian Gray”, “Gone with the Wind”, “Dr. Zhivago”, “Black Beauty”, “The Help”….and so many others who only wrote one book. Writing more than one book is certainly great if you want to make money in today’s market…but booklets…commuter fiction, I’m not buying it. I have read one novella that was given to me for free. I enjoyed it, albeit somewhat brief and lacking IMHO, but I felt strongly that I was reading an advertisement for other work. Would you pay someone 99 cents to read their ad for a $4.00 pair of socks? I like value, and I love reading. I like to find something I enjoy reading, and read it on a large scale. If it’s an epic, the Look Inside will provide a very good writing sample to judge by. Plus, the writing of a short story and novel can vary considerably. I’m a fan of a series of hearty novels. It places a premium on choosing wisely; and if you make it through the series, it’s a nice reward for the hard-working author. I say Kudos to Amazon for making it possible. Good to know options are available for those who may feel less is more, and the information you provided reminding people to Look and Read about what they are purchasing is invaluable. While I prefer full-length novels, I don’t think there’s anything wrong with novellas or commuter fiction. My biggest issue with it is how difficult it is to tell which is which when I’m browsing for my next book on my Kindle. I’ve gotten in the habit of always checking page count now, but that was after I’d been burned a couple of times. It’s not just that I like longer stories, but that I hate spending $3 on a novella when I could have bought a book for that or maybe a couple on sale. At least most authors and publishers are getting better at labeling the shorter stories novellas are noting it at the top of the description section. It’s amazing how the same $3 can get anything from a short story to an epic fantasy omnibus.